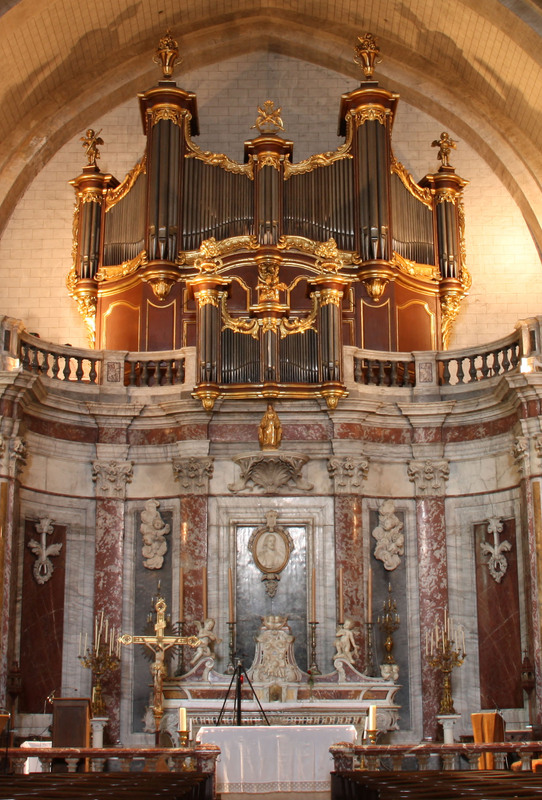 The organ was constructed by Jean-Baptiste Micot (1712-1784), aided by his son Jean-Baptiste Micot Junior (1740-1815). This instrument belongs to the best preserved organs of acclaimed French organbuilding family. The organ is located above the main altar of the church on its west side, since the church has lost its original Romanesque shape in the Hugenot wars when the eastern choir was destroyed. When the church was restored in 1711, its traditional liturgical orientation was reversed and the new high altar now occupies the west end of the church, together with the organ. The old Roman Catholic bishopric merged into the diocese of Montpellier after 1801, and the place lost its importance and most of its funds. As a consequence of poverty, the church and the organ was spared from most innovations of 19th and 20th centuries, so that it could be handed to us in almost intact form. The organ was altered a little by Clavel in 1830 when the descant of Vox humana was renewed, and then by Puget in 1870 who changed the pitch, but respected the original layout and stop list. In 1980-1982 Bartélemy and Paul Manuel Formentelli provided the restoration of the instrument to its original state. The care of the organ is now entrusted to Michel Formentelli, who did a major overhaul in 2008, which is well documented on the web pages of the St. Pons organ. Thanks to the restoration, the organ has the typical sound of an 18th century French instrument and all the French repertoire of the time can be performed in the appropriate style on this organ. Special thanks for the magnificent help from the members of the Association Jean Ribot des Amis de l'Orgue during the recording and for their patience with the sample set - the recording was done in 2014! Bourdon-Montre 16' in the pedal is a virtual transmission from GO, not present on the original organ. This virtually added stop can be found only on the Simple jamb. The samples are offered in 48kHz/24bit resolution. The multiple releases have three levels: short, mid and long. Hauptwerk v4.2 and higher supported. The sample set is encrypted, dongle update required. The original compass of the keyboards is 50 keys (C, D-d3); lowest C# missing, added in the sample set. The original compass of the pedal division is 24 keys (C, D-c1), extended to f1 in the sample set. Almost all ranks were recorded with the Tremblant Doux for the most convincing tremulant behavior. The ranks are marked "tremmed" in the rank description. The Tremblant Fort is made using the Hauptwerk tremulant model. Screen resolution 1280x1024 px or more. Polyphony of 4500 voices recommended for the full suround. Polyphony of 2500 simultaneous pipes recommended for use of the wet sample set. St. Pons en Thomieres, Orgue Micot heeft nog geen reviews. Deel uw product ervaring en plaats een review.